Is this module now a paperweight? Home/ Extensions /PayPal Express Checkout Button ? I just get a status dropdown to select enabled/disabled and a save button. This button does not seem to appear anywhere or do anything. Can someone please add this to the list of bugs that need fixing in 2.3.0.2? Seems like the positioning for this button is in Home / Layouts . Users coming from 1.5x may find this post useful. As for my recommendation here, for modules like this that require further customization, it is to place some description in the module to help the user complete this customization. This error does not happen in subsequent logins. I have no idea what the implications of this are or how to fix it. Another problem with paypal login, is that it does not seem to categorize the customers under their own customer group. I deleted all customers and logged in using pp. My customer group was 'default'. if this is not the right place to post these for the right attention please let me know so I can move them. Hi, i forget my admin panel password. when i try to reset password. forget password link/option is missing on my admin panel. i also attached screenshot as well. please suggest me what should i do am using opencart first time. OC 2.3.0.2 missing text in the Forgotten Password of Affiliate Program. Multilingual support for google sitemap ?? CoronaTechniek wrote: Multilingual support for google sitemap ?? Mulitlingual sitemaps where never be created - guess you have an extension installed for that. Straightlight wrote: It has been addressed by qphoria on the followed topic: viewtopic.php?f=190&t=135582&p=612435&hilit=orders+no+results#p612435 not to apply bug fixes with VQMod due to the specified reasons. Qphoria wrote: Don't do bug fixes with vqmod because you'll forget about it later and it can cause adverse results when the bug is actually fixed in the core. Just replace the code.. its only a single line. Why not put a version check in the vqmod and have it displayed prominently so it wont get forgotten? Did someone forget to add this ?? needs to be removed, so just comment it out to stop your errors. Thanks for that i shall comment it out. its been changed on github so will be fixed in the next release. I have been trying to get OpenBay to work with Open Cart 2.3.0.2 and Amazon US for 6 weeks. Working with OB support we have identified numerous software bugs including a database error. OpenBay should list the fixes on this site. I feel that the OpenBay extension should be removed until OpenBay can verify that it is working with 2.3x - it does not, yet they are selling subscriptions for their service. As my client requires a working link to Amazon US from the store, we are going to swap to Magento as this will give us other options for linking. 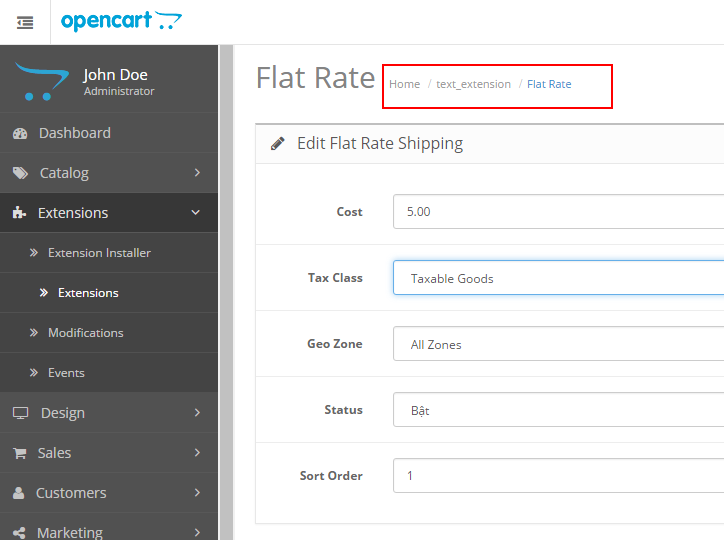 I think OpenCart has made a big error locking into one software extension. I wonder if the sun is shining outside? calderwood wrote: I have been trying to get OpenBay to work with Open Cart 2.3.0.2 and Amazon US for 6 weeks. Working with OB support we have identified numerous software bugs including a database error. OpenBay should list the fixes on this site. Last pagination icon (goto end) wraps onto next line when viewing more than 9 pages of products. css selectors need adjusting slightly to fit the pagination in so it does not wrap around. Other: there are more files with the same code, but these were the important customer facing ones. Categories, Filters or Downloads - I am unable to select items to add to the list there as the drop down doesn't appear. Not seeing any warnings or errors in the console log. My work around was to use Chrome. Same browsers/System as yourself, but I don't think that is the issue.